Goodbye ApplesandRubies. My new website and blog are up and running! Please come over and check out the brand new EcoHappy Style website and EcoHappy Blog ! 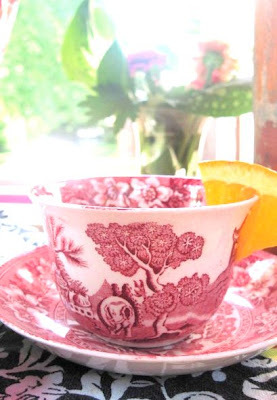 My motto for my new EcoHappy Blog is Fabulous Green Design and Smart Eco-Friendly Living. Please come by and tell me what you think! I would love to hear from you. 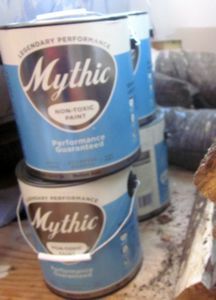 Mythic Paint Can be Mixed in Benjamin Moore Colors! I bought Mythic Non-Toxic Paint to paint my new windowseat addition and living/dining room. 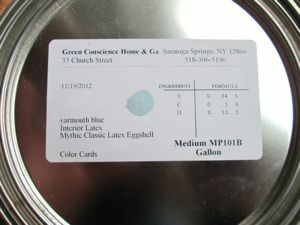 I was happy to find Mythic will color match any paint company's colors! I'm looking forward to trying this non-toxic, ultra low odor VOC-free paint. We have a nice blanket of snow on the ground here in Albany, New York - and enough cold weather that the snow is sticking around. Which is good, because if it's cold I want my snow! 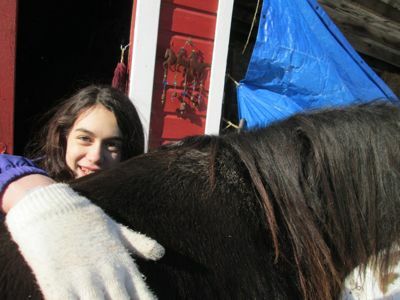 I took the kids to out to the snowy countryside visit my Friend N and her sweet horse, Tom. Such a pretty scene. 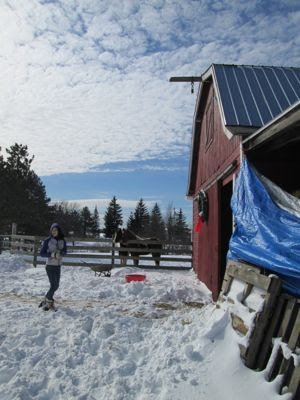 My friend boards her horse at a beautiful farm. The day was bright, sunny and not a hint of wind - amazingly peaceful. 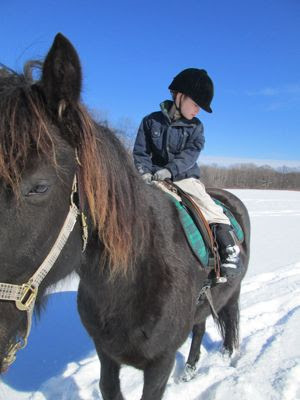 Each kid got a chance to feed, brush and ride Tom. 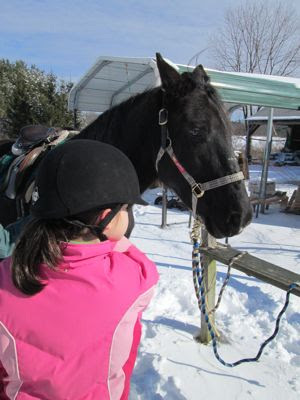 What a great way to spend a sunny winter day! 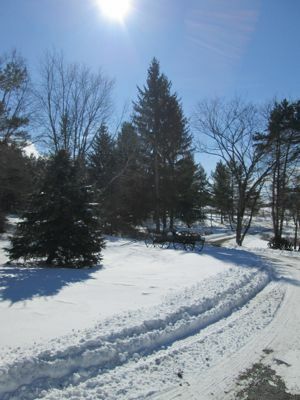 Do you have snow on the ground? 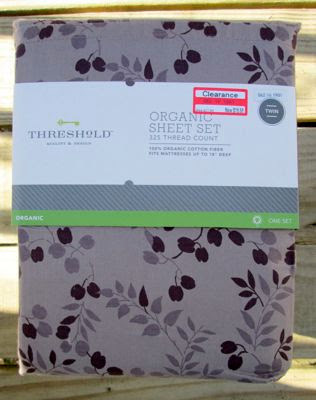 Organic Cotton Target Sheets on Sale, and A Winner! I am minimalist when it comes to sheets in the house - a simple two sets per bed. I bought new sheets for the girl's beds two years ago at a big box store in the sale bin - they were a cute pink floral pattern and only $20 a set, BUT they were thin as tissue paper out of the packaging, and started pilling as soon as they were washed. 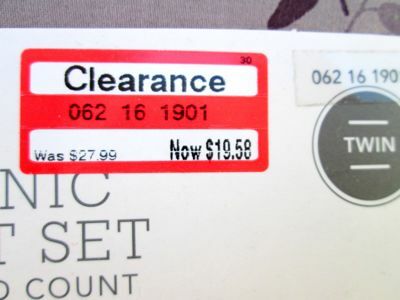 So how happy was I to find these organic cotton sheets on sale at my local Target? 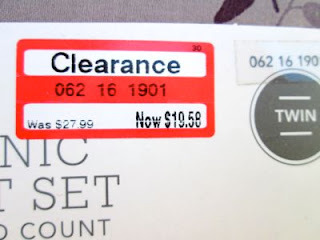 ... and just under twenty dollars! We have a set of these Target Threshold 325 Threadcount Organic sheets on my queen size bed in solid white and in solid grey, and they have held up very well. I actually like the simple purple floral pattern I bought better than the fussier new floral patterns. But I do like the new grey and white check pattern. It would be perfect for a boy's room. Son H might get a new set, soon! ...and I have a WINNER! 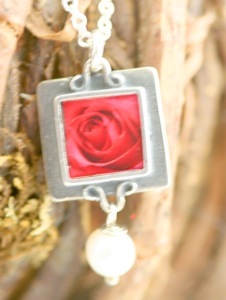 Congratulations to lucky Danica S. for winning my Valentine's Jewelry and Chocolate Giveaway! Thank you to everyone who entered! Her vibrant red dishes will make any meal full of love. 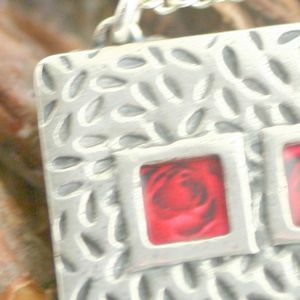 Don't forget to enter my ongoing Valentine's Day Giveaway (find the giveaway post here) to win my romantic Maria necklace. 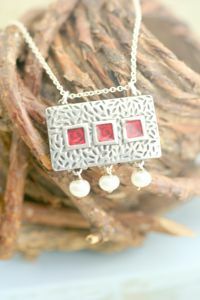 I am drawing the winner February 16th at noon. The winner also gets a tempting box of chocolates? How can you resist that! I am enthralled by the talented designer Judy Longbrook's Oregon home in the latest issue of Portrait of Portland magazine. The most amazing room? Her home office, with walls of reclaimed wood. 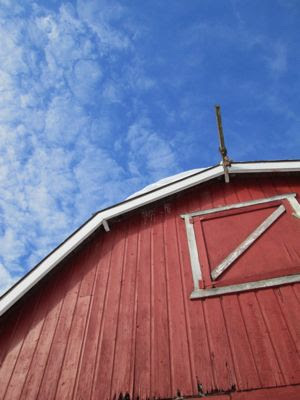 When the foundation of the 1940's home was raised and rebuilt as part of an extensive remodeling, Judy saw the boards of vintage subflooring that were going to be thrown away and snagged them. 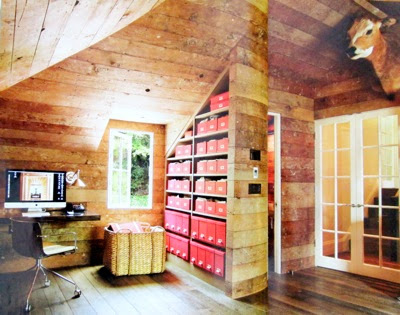 As her home renovation proceeded, she grabbed all the subfloor boards she could and incorporated them into her home office design. 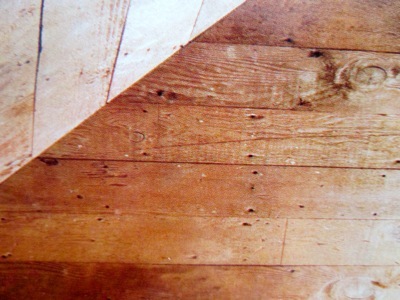 In the days before plywood, builders created a subfloor by using wide wood boards of lower-quality wood laid at a 45 degree angle over the floor joists to create a level base to lay the down the finished floor of finer-quality wood boards. The aged character-filled vintage subfloor boards lend a rustic presence to the dramatically angled walls. What a wonderful space to work in! Here is a view looking into the office. 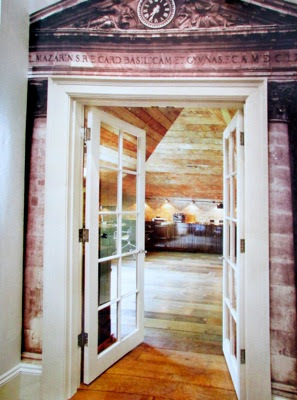 Judy enlarged the entrance and had her son shoot photographs of grand double door entryways in France. From his photographs, she choose a photograph of the entrance to the library at the back of the Lourve and had it enlarged to paper the wall leading to her office. 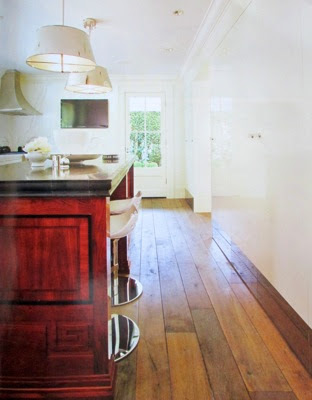 The floor boards in the home are salvaged antique reclaimed oak flooring from Los Angeles's Exquisite Surfaces. The re-use of old wood in this home grounds this home in earthy beauty. The warmth, patina and history of reclaimed wood add such a wonderful touch. I'm ending this post with this beautiful image - a close-up of the office walls of reclaimed subfloor boards. Notice all the nail holes? Because the subfloor wood boards were originally nailed down AND then had flooring nailed over them, the boards have lots of imperfections, and tons of character and style. Lauren Liess of Pure Style Home summed up imperfect materials recently in a post on her kitchen island: . 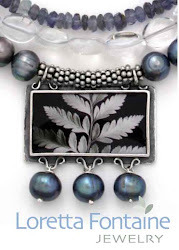 "..what I love about most natural things, life changes it and makes an impression on it. I don't get why unchanging and perfection should equal beauty"
p.s. 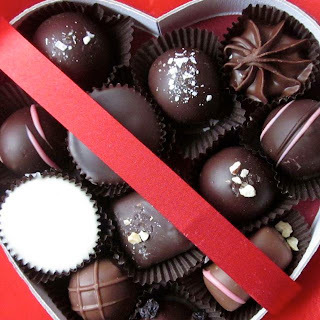 Don't forget to enter my chocolates and jewelry GIVEAWAY. The winner will be drawn on February 16! Roses are one of my favorite flowers. With Valentine's Day around the corner I love to see them everywhere. 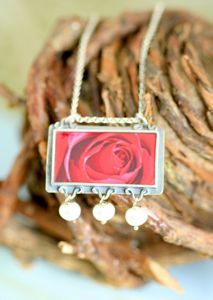 Visit my web site www.LorettaFontaine.com to view this necklace and others. p.s. Don't forget to enter my jewelry and chocolates giveaway. The winner will be drawn Feb 16! Loretta Fontaine Jewelry is on Facebook! My new blog: www.EcoHappyStyle.com I'm a Green living advocate, author, blogger, photographer and designer with a background in Architecture. I blog on Fabulous Green Design and Smart Earth-Friendly Living. 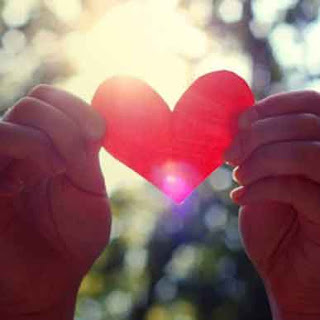 Top Ten Ways to Spend 25 Minutes - Creating a More Centered and Joyful Life. A home comprises people...and lots of pillows. copyright 2013 Loretta Fontaine. Simple theme. Powered by Blogger.